Today I inaugurate a new category here for some of the subjects I’ve coming across: Gone and Forgotten. The Earle Hotel, which stood for 83 years at Jefferson and Michigan downtown, has probably been forgotten by now. It was memorable only for the huge fire that destroyed it on April 26, 1974. Downtown used to be full of dirty brick buildings you wouldn’t dare set foot in, and the Earle Hotel was one of them. 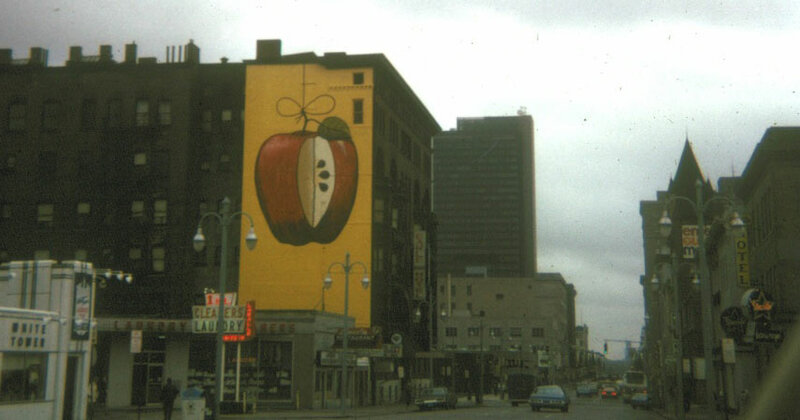 The Earle Hotel, sometime between 1973, when the mural was painted, and 1974, when it burned. What managed to jog my memory was the picture at left, from the Toledo Lucas-County Images in Time website. It’s a view, from eastbound Jefferson Ave., of the Earle Hotel with an extremely short-lived mural of an apple. The Blade’s story the next day recounted the hotel’s history thoroughly. The Monticello was a well-regarded hotel at first, but after that the hotel was given to fires, suicides and violations of city health and fire codes. Even this 1911 story in the News-Bee details a state inspector threatening arrest of the manager over fireproofing and electrical violations dating back to 1909. 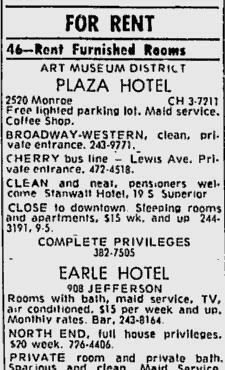 Come live at the Earle Hotel (1972 want ad). It was renamed the Milner Hotel in 1938 and became the Earle in 1970. The Earle became the home to the elderly, transients, and families placed there by the Lucas County welfare department, as well as anyone who could afford the $15 a week rent. Suicides and robberies occurred regularly, and two major fires in 1968 and 1971 left the building so damaged that in 1972, the health board issued a 15-page order closing the building citing fire damage, faulty plumbing and wiring, and evidence of rodent and pigeon infestation. The 270-room hotel was ‘unfit for human habitation,’ the board of health told the hotel’s management. After agreeing to make repairs, the owners instead decided to close it in early 1974, saying that the property would probably become a parking lot. Prior to its closing, artist Charles C. Elliott, a Toledo artist and president of Wind, Inc., painted the large mural on the west wall of the Earle. The Ohio Arts Council gave a $1,000 grant for the mural and the city’s urban renewal agency contributed paint. Six months later, on a Friday evening, the Earle caught fire. The first alarm was turned in at 7:50 p.m. and crews from No. 5 station, two blocks away, immediately called in a second alarm. The fire in the huge seven-story building, which was mostly constructed of wood, spread quickly, and spread cinders prompting the precautionary evacuation of several buildings nearby. The fire and smoke could be seen for miles. A motorist said he could see the fire as he drove on the Ohio Turnpike between (then) exits 4 and 5. The crowd was happy as long as the fire was bright and the walls kept falling. 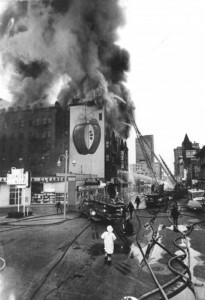 As firemen brought the blaze under control, and gray smoke replaced the bright flames, the size of the crowd decreased. Customers of the Starlite Lounge, at 925 Jefferson, pressed against the front window, drinks in hand, to take in the action. Other customers, apparently undaunted by the fire, continued to play pool. This is more evidence of what I believe to be the longstanding tradition of Toledoans making a special effort to go and watch fires. I think it will surprise absolutely no one that the site of the Earle Hotel today is, just as its owners promised, a parking lot. Strangely, the Earl lives in memory for me as a neon sign and an almost gothic-looking dark structure, seen from my parents’ passing car of the early 70’s. I always marveled at what the Earl must be – perhaps channeling groovy vibes from 60 years earlier. Nevertheless, the date of this fire nearly matches our exit from Toledo. We moved back to Dayton that year, and I never, of course, saw the Earl again, but I always remembered that image – often right around dusk. I was leaving Rossford Oh. Going on my First date with my new Girls friend. As we traveled on Dixie Hwy. I saw the smoke rising. By the time we got to I-75 & Miami St. We could see flames & smoke coming out of Downtown. We traveled to a area as close as we could get to the Fire in Earl Hotel to park. We walked up to the scene. I saw my Dad who was Operating #6 Aerial Ladder. Needless to say. We stayed & watched the Fire & the people. We stayed till curfew of 12:30 am. 6 Hours of Free entertainment. My Mom & Sister were also watching the Fire. One of those Dates I will never forget. Thank God that The High Pressure Fire hydrants were still in use. The unlimited water from Maumee River save Downtown from being a multiple building conflagration. 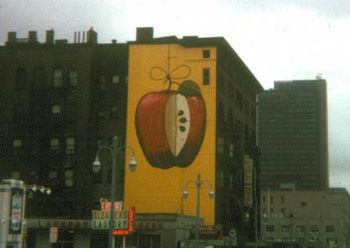 How absolutely to form that a state government agency would blow $1,000 1973 dollars on having a mural painted on a building unfit for human habitation. Toledo in the early 70s was the poster child for inept, even criminal, urban decay (and it ain’t much better right now…). The hotel had the name “Earle Hotel” in the 1950’s because I had a great grandfather that was living there when he died in 1951. Another newspaper article refers to the Earle Hotel in 1950.